“SURPRISE!! !” Everyone screamed at my cue to perfection! See the video of her shocked reaction here. And I kid you not. She literally shook and practically got the shock of her life when she opened her eyes. It was quite a sight! She expected one present from one person, but she was greeted by nearly 40 people instead. I gathered both sides of the family, her closest girlfriends, my closest man-friends and our beloved cell group. What a gathering! But seriously, how could I ever allow her birthday to pass without a birthday party? I saw absolute delight on her face as she celebrated with the some of the people she was most intimate with in her 24th year on Earth. See how she was nearly presented her cake by the wrong guy here. They were ready to see her through a new phase of her life. “Okay, this is the final part – I have no more surprises after this.” I told her and her parents (who found out about this party just 15 minutes ago) as I finally began to unwind in my mind. I have never been happier telling the completely honest truth. 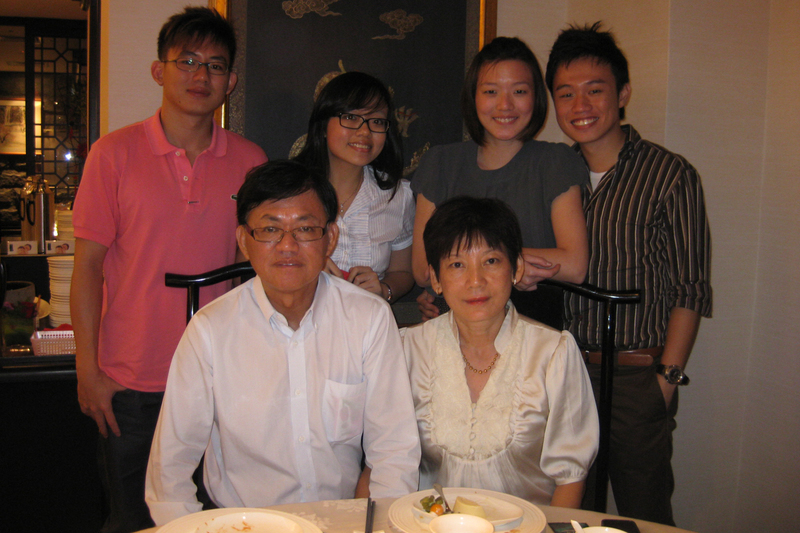 One by one, our friends approached my mother, her parents and the both of us to congratulate us of our engagement. We were flooded with handshakes and hugs, and it was such an unbeatable feeling. Throwing a party to celebrate this moment proved to be a wise choice after all. And I was pleased with my decision to go over-the-top. 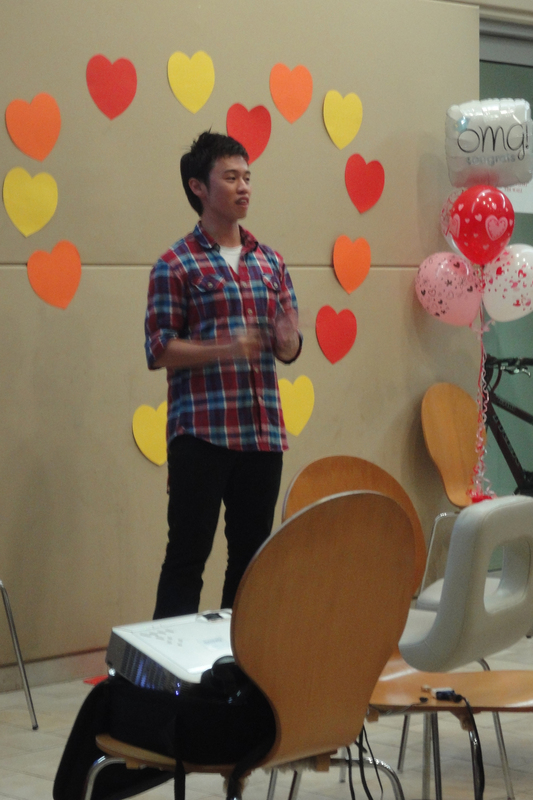 I gave a short speech after the birthday cake and song presentation to thank everyone for turning up as well as to give credit to our friends who worked so hard behind the scenes to make this proposal so successful. It was joyous time of merry-making, congratulatory conversations and re-telling of the entire day’s worth of memories. Huiyi and I individually and together, felt the love in the room for the both of us. We felt so blessed to be so wonderfully supported. I am intentional in almost everything that I do. And one of the reasons why I wanted to throw a party for Huiyi was to show her parents how well-loved and supported we were. I also wanted both sets of parents to interact in the midst of our friends, just as I wanted Maisie (and her boyfriend, Bryan) to get to know Xianyi (and his girlfriend, Eileen) a little better. 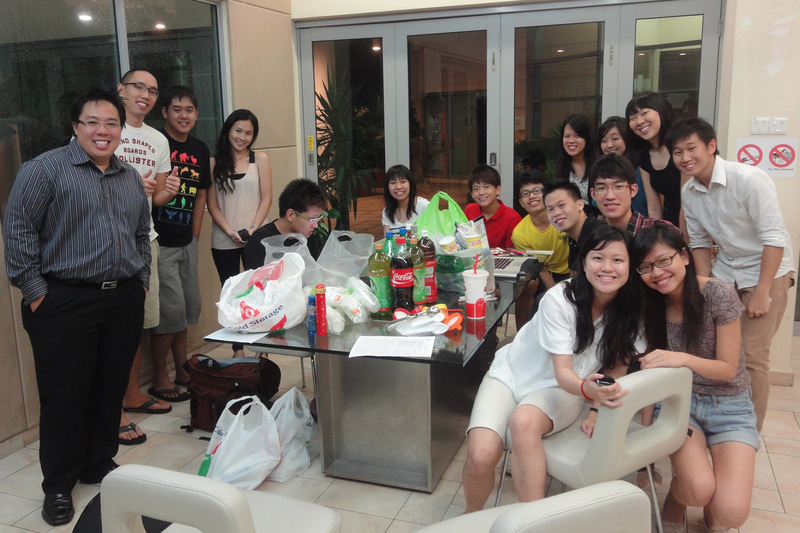 Having this precious group of people turn up was extremely meaningful and significant for us. 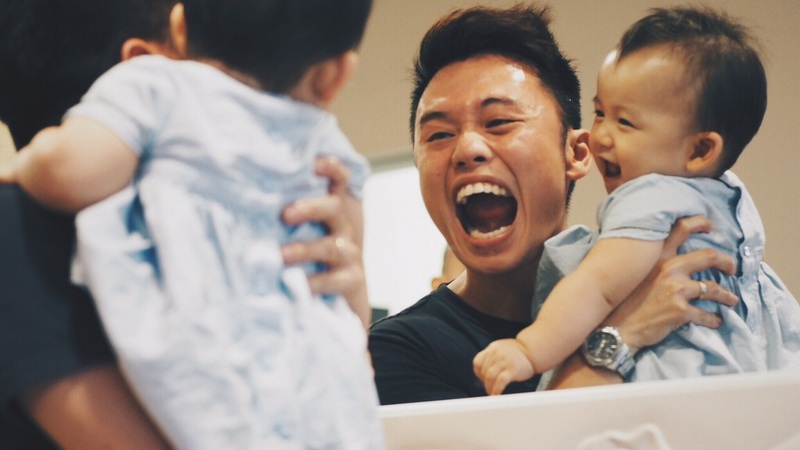 More importantly, I wanted to show Huiyi’s family what a Christian community was all about. And I think we managed to achieve it. Next chapter: the professional post-production pace. We finally checked into Privé (which by the way is translated as “Private” in Dutch), where the waitress had been expecting us to return to reclaim our belongings. I had called the restaurant earlier and asked for the best and most “privé” seats in the house, explaining that it would be our first meal together as an engaged couple. I also asked if Privé had any special arrangements for birthday celebrations. As we waited for the food to arrive, I showed her the self-composed lyrics of my Chinese song and explained the meaning to her. I also described the process of producing the ring, the coordination required for today and the amount of dedication that the crew put in for us, amongst many other things. She admired the ring and was still taking in full effects of the life-changing hour that just whizzed her by. She didn’t say much, but her absolutely contented smile spoke volumes for me. Before the food arrived, I asked Huiyi to call her family to tell her what happened. At this point in time, only Xianyi in the Lee clan knew that there would an engagement party later. So even as Huiyi was regaling the recently-concluded proposal to her parents, Huiyi and her parents had absolutely no idea that there was going to be part two. I asked Xianyi to only tell his parents about the engagement party after Huiyi’s phone call. Yes, I left absolutely nothing to chance. While Huiyi was on the phone, I approached the restaurant manager to ask if they had an iPhone charger in the premise. The evening wasn’t over and I desperately needed to charge my iPhone with only 4% of battery power remaining. Coordination work wasn’t over and I needed to power up! When the food arrived, we prayed together for the first time as fiance and fiancée and gave thanks for the food. It was a special moment indeed. And we took our time to enjoy the delectable food. 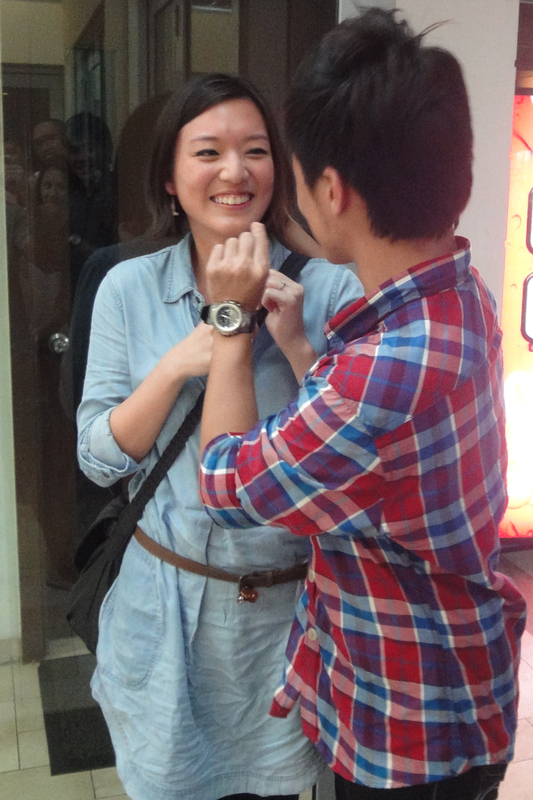 She was thoroughly surprised and completely grateful for the extravagant proposal. She thanked me profusely for all the effort I put in. I smiled and acknowledged. She’s the only one that I’d do it for. Next chapter: the drive back to Lakeholmz. There weren’t many people who knew about the proposal. I wisely decided to keep it from her parents because I wasn’t confident that they could contain their own excitement and keep this secret from her, but I chose to confide in her brother, Xianyi, instead. 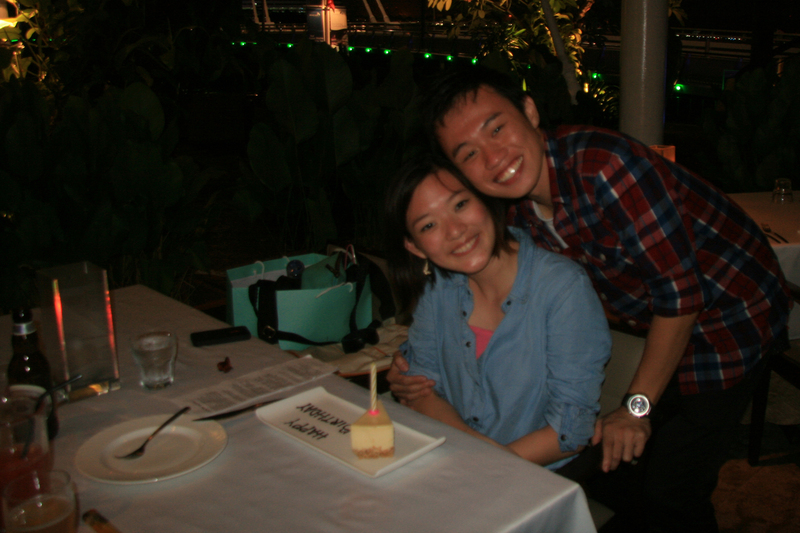 The reason why we couldn’t visit USS on Thursday was that we celebrated her birthday with her family on that evening. And the reason we deliberated for a week was that she was trying to arrange for an evening where her parents, brother and his girlfriend, as well as both of us were all available. It was so trying that she had nearly wanted cancel the family dinner. And Xianyi, another unsung hero in this story, couldn’t intervene as much because he was supposed to help me keep it a secret. He skipped a school lesson to ensure that he was available on that Thursday evening for the family dinner, and missed a birthday (or farewell) party on Friday evening to ensure that his parents were home. More on that later but know that these are important pieces of information. Normally, a boyfriend would pay special attention to his girlfriend’s birthday. But this dinner was so low-key to the extent that I forgot to buy a birthday cake on Thursday and had to trouble Xianyi to do it for me instead. My mind was focussed on one thing only – the proposal. I was surprised that Huiyi didn’t suspect anything from my lack of preparation for this birthday dinner. 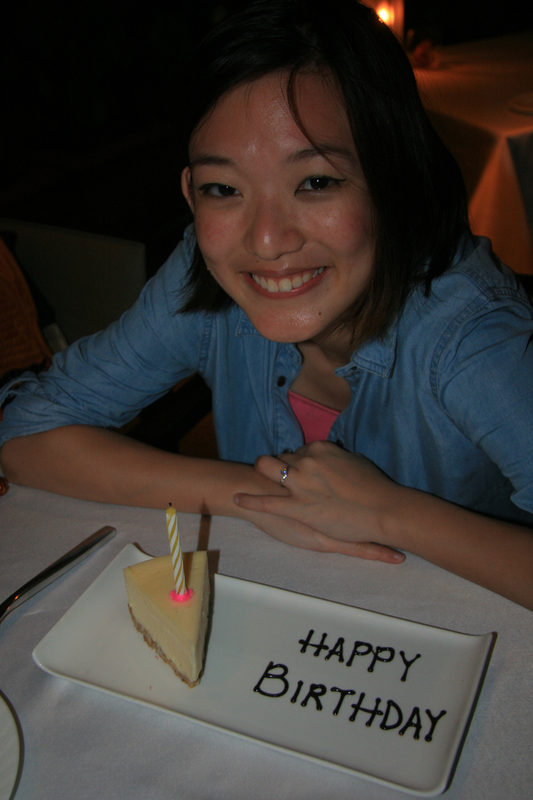 Anyway, we celebrated Huiyi’s birthday on Thursday with her family at Peony Jade and this left Friday cleared for us to spend the day at Sentosa, as well as to have a private birthday dinner at Privé. Initially she wanted to dine at Lawry’s (and I had already made reservations for two) but I convinced her that Privé would be a better choice, simply because of location. Now by this time, you might have realised that the original proposal plan had modified significantly, because she decided to take leave on her birthday to spend a day at USS together with me. The original plan was to propose at MBC, then head to Lawry’s for dinner. But I had to throw that idea away, as well as the office surprise by her girlfriends. Why? Well, she wasn’t going to be at work that day! A major modification, but it was still fundamentally the same idea. (I couldn’t get) Sunset by the (beach, so instead I got sunset by the) bay – check. I was good to go. 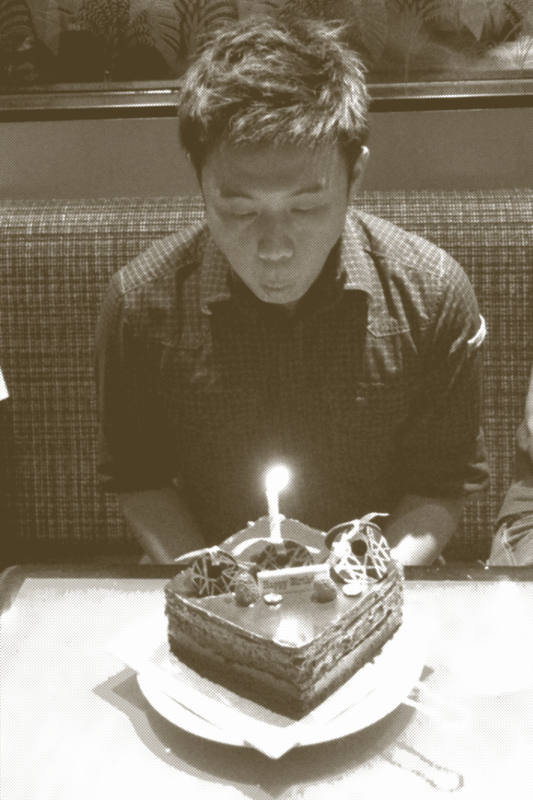 Next chapter: the inception – the surprise within a surprise.